• Buy Gift Cards – Personalize and send Visa gift cards and MasterCard gift cards to friends and loved ones. • Send eGift Cards – Virtual gift cards that are delivered via email in minutes. 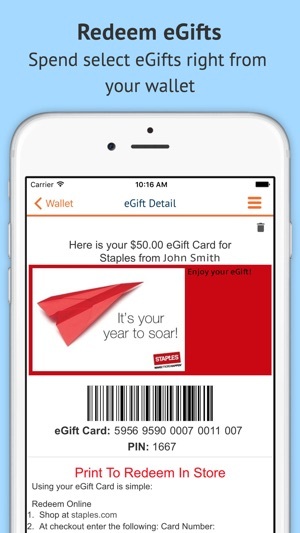 • Gift Card Wallet – Add and spend GiftCards.com eGift Cards in store (select merchants only). 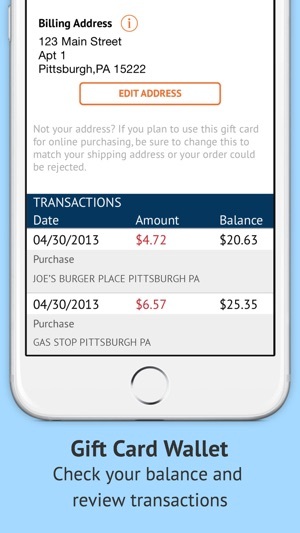 • Check Gift Card Balance – Add GiftCards.com plastic gift cards to wallet to quickly check balance and transactions. • Gift Card Rewards – Get reward points towards future gift card purchases with every purchase. This app is brought to you by GiftCards.com, the highest-ranking and most-trafficked gift card website on the Internet. If you're looking for a unique and personal gift for friends, family, or you just want to make someone smile, you've come to the right place. 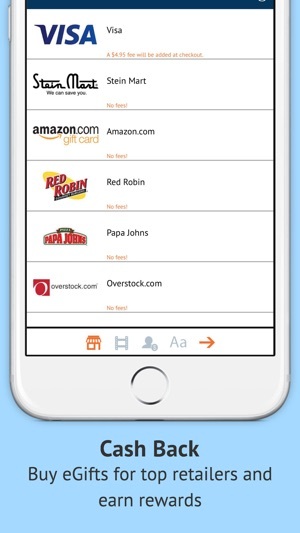 Our gift card app allows users to create personalized gift cards and send eGift Cards for top retailers like Amazon, Best Buy, Home Depot, and more via email. 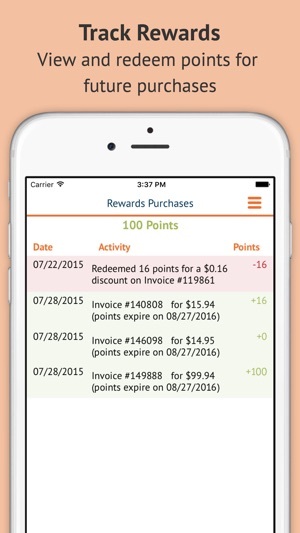 Download our app and start earning reward points today! For a last-minute gift with immediate delivery, purchase an eGift card and the recipient will receive it within minutes. 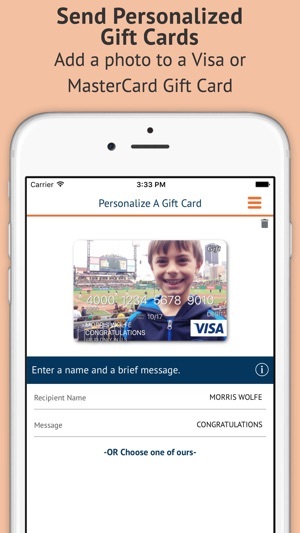 Once an eGift card is selected, load it with your desired amount, and personalize the gift with a message. Merchant eGift cards are redeemable online or they can be printed or downloaded to mobile apps and redeemed when shopping in the stores. Our gift cards can be used anywhere in the United States that Visa or MasterCard are accepted. Gift card purchase is available in the U.S. only. In this version, we've fixed some bugs around searching for greeting cards and entering shipping information. This website and app are completely pointless and ran by robots. I tried 5 TIMES with 2 different emails to buy an e-card and a gift card. After a lengthy sign up process all of my orders were CANCELLED. The credit card that I used had sufficient funds, I double checked my email info, my billing address matched my credit card, I provided a correct phone number but each transaction was declined. They email you and give you a “case number/reference number” to make you think your orders are being investigated but they aren’t. THEY SAY THEY CANT TELL YOU WHY YOUR ORDER IS CANCELLED BC OF SOME TOP SECRET BS. This would have been perfect for my business. Huge waste of time. No one on the phone can give you an answer they just read from a script. They sent you emails from a script. DO NOT WASTE YIUR TIME WITH THIS APP. I have now spent over an hour trying to load two gift cards into your app. When I try to change the pin it says the pin is changed but then says it’s wrong. When I use my old pin it does allow me in but then tells me there is an error reading my card. When I try to enter the card manually it tells me I have to go back to the email. When I click on the link to the email it makes me enter the information again! Horrible horrible app! If there was a way to rate it no stars I would. I was skeptical given the reviews if the app would work. I was able to order two $500 GiftCards. Both w/ custom graphics printed on the card. They arrived timely and worked great. I did not experience the issues others have mention. Based on my experience. Highly recommended.